Half-day classroom, Online or Blended with 2 hour classroom skill practice session:Preview this workbook immediately! Does the phrase, “if you want something done right, do it yourself” resonate with you? 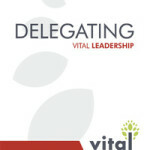 It can often be difficult to delegate responsibility to your team members. However, doing so ensures that you are not spread too thin and that you can focus on critical priorities. The ability to effectively delegate is essential to getting the most from your team. It helps balance the workload and builds stronger relationships within the organization. Effectively utilizing your team gives you more time to interact with management, colleagues, and team members, helping you to develop deeper and stronger connections across the organization as well as within your team. Delegating responsibility also demonstrates that you trust your team members, while also encouraging the development of their skills. In addition, it will help your team members believe that their jobs are important, meaningful, and critical to the success of the team and organization. 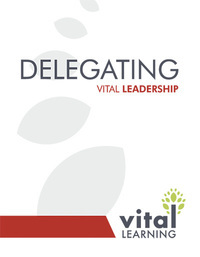 The Vital Learning Delegating™ course teaches supervisors, team leaders, and managers how to develop team members in a way that strengthens the team’s commitment to the success of the organization. A properly delegated task teaches team members accountability and responsibility, so employees feel more a part of the team and the entire organization. Click on the “e” to immediately enroll and begin the Delegating online course.